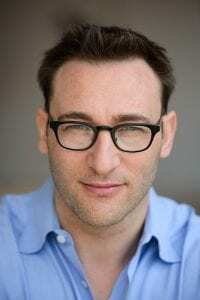 Tag Archives for " Leaders Eat Last "
For this week’s episode of the Duct Tape Marketing Podcast, we’ll revisit my conversation with Simon Sinek, author of Start With Why and the most recent Leaders Eat Last. First off, if you’ve not read either of these books, I suggest you get both. In Start With Why Sinek echoes many of themes surrounding purpose that I’ve been preaching for years. Leaders Eat Last is a bit of a follow up in that once you have your “why” you must go to work on attracting and leading with whom that why resonates. As Sinek explains, the title of the book is drawn from a long-standing, yet undocumented, policy in military mess halls in which leaders by rank eat last. Perhaps the primary point in the book is that the true art of leadership isn’t about ruling with power, it’s about helping others get what they want. Sinek compares that act of parenting to leadership. In a perfect world, a parent wants what’s best for a child, helps them reach their full potential and doesn’t always get to be their best friend in the process. But the key here is trust. When we trust a leader, even if we don’t actually like spending time with them, we will follow them. Sinek uses the success of the 12 Step Program widely used in Alcoholics Anonymous to make another point about true leadership. Over the years, AA has found that if people successfully move through the first eleven steps but fail to embrace the twelfth, they often fall back into old habits. The final step asks them to help another alcoholic find recovery. The message and perhaps paradox of leadership is that in the end it is simply the act of helping others get what they want. How is your title inspired by the military? How does leadership, or lack thereof affect job satisfaction? 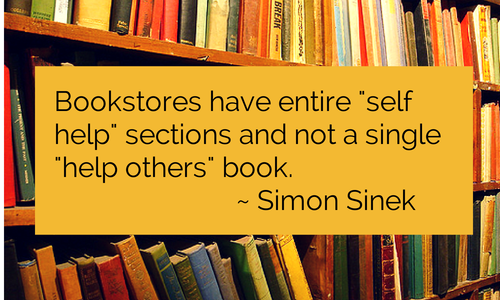 Marketing Podcast with Simon Sinek [Tweet “Bookstores have entire “self help” sections and not a single “help others” book – Simon Sinek”] For this week’s episode of the Duct Tape Marketing Podcast I had a visit with Simon Sinek, author of Start With Why and the more recent Leaders Eat Last. First off, if you’ve not read either of these books I suggest you get both. In Start With Why Sinek echoes many of themes surrounding purpose that I’ve been preaching for years. Leaders Eat Last is a bit of a follow up in that once you have your “why” you must go to work on attracting and leading with whom that why resonates. As Sinek explains, the title of the book is drawn from a long standing, yet undocumented, policy in military mess hall in which leaders by rank eat last. Perhaps the primary point in the book is that the true art of leadership isn’t about ruling with power, it’s about helping others get what they want. Sinek compares that act of parenting to leadership. In a perfect world, a parent wants what’s best for a child, helps them reach their full potential and doesn’t always get to be their best friend in the process. But the key here is trust. When we trust a leader, even if we don’t actually like spending time with them, we will follow them. Sinek uses the success of the 12 Step Program widely used in Alcoholics Anonymous to make another point about true leadership. Over the years AA has found that if people successfully move through the first eleven steps, but fail to embrace the twelfth, they often fall back into old habits. The final step asks them to help another alcoholic find recovery. The message and perhaps paradox of leadership is that in the end it is simply the act of helping others get what they want.